Great flood of Kerala and a review of our disaster management preparedness. T. P. Gopinath, August 19, 2018. Introduction; are we really prepared for managing disasters? Which agency commands and coordinates a response? Can NDFRF (The National Disaster Response Force) take over? How preventable was this flood disaster? Dam management, do we still retain the trust of the concerned authorities? Orange alert and red alert, do you know what they mean? As this story is being written on 19th August 2018, Kerala’s great flood fury is still raw. The last few days, with round the clock television coverage, has seen some very heart-rending news coming out from my state. The flood relief effort, as we all know has taken place with utmost sincerity from public, police force, and fire department. Governments various departments, political leadership, Kerala’s local fisher men, local people of the affected localities, NDRF, and Indian military’s various units’ have all put in herculean efforts in the relief and rescue operations following the flood. However, did we do a good job over all? By opening all dams at the same time, didn’t authorities add more waters to the rivers that were already ready to burst the banks? With all the warning signs present, why were the decision to open dams delayed so much? Since this disaster and its aftermath is already endured by the population, what is the work that will be done in future disaster risk reduction and a well-coordinated and forceful response once a disaster strikes? Great Flood of Kerala! Picture Courtesy: Egypt Independent. It is heartening to see the collective response of the state of Kerala against the second greatest flood Kerala has ever seen. However, for the cautious and those who believe that the preparation and planning is of foremost importance in disaster risk reduction, the question remains that whether our disaster management preparedness has been setup for a firefighting type of response. There are many people including this writer, who may be forced to term the overall coordination and disaster management preparedness and planning in our state as abysmal. As a state that is ranked highly in social parameters, we want to avert disasters so that we wouldn’t even need a response in the first place. But if the government cannot even give a well-coordinated response, after we are struck, how meaningful it is for us to expect the government machinery to put their mind and political will on averting disasters altogether? How well prepared are we to prevent and mitigate disasters and shouldn’t our approach be based on preparedness and proactive action rather than reactive, rescue, and relief? Are we going forever to fight the fire without a planned approach in preventing it? Once we are struck with a disaster, the first thing that is visible is how the coordination at the top of the response team is being handled. I failed to see much of that coordination during the great flood of August 2018. Clearly, we have a long way to go before the next disaster strikes. People and the government seem to tend to bask in the glory of a fractured but forceful response and relief effort. However, only planning, preparedness, and a response based on the best coordination at the top of the order can save us from the next disaster. I have neither the qualification nor the professional experience in disaster management to write an enlightened piece. But pitfalls in disaster management of the great flood of Kerala as well as the sincere efforts of the teams are there for all to see. Please do not forget that more than 483 people have died and 14 are reported missing, according to the figures cited by Wikipedia. Hundreds of people have lost their lives and innumerable sufferings have been forced on thousands of others. A lifetime of hard work is in vain for thousands of very ordinary and poor people across Kerala who were always struggling to make ends meet. Our complacency and laid-back approach to preventing disasters, preparing for another, and a habit of destroying the nature that apparently aggravated this flood fury and landslide disaster, needs to be stopped, to save our state often termed as Gods own country, for future generations. The first thing government came out as the flood disaster struck, was to notify the helpline numbers in various locations for people to call and find out about their loved ones. If these helplines were indeed effective, there was no need for TV channels to setup their own helplines as they were being inundated by calls from the friends and relatives of the affected. It brings us to the question, what is the overall high level plan for a disaster management in our state if we can’t even take the calls? No one in their living memory would have witnessed something like what just happened in the form of a great flood during the third week of August 2018 in Kerala. The scale of the calamity has been so great that government had no idea how to respond. However, if it was a cautious leadership, subtle signs were already present in front of their eyes, such as the floods that caused havoc in Kuttanad (a region in Alappuzha and Kottayam districts of Kerala well known for its vast paddy fields). Also, just weeks before, the forecast of heavy rains, and reports of dams filling up fast, were hitting the news. These signs must have forced a caring administration into a disaster planning and response mode and putting on notice the official first responders much well in advance. Why were the call center facilities and the numbers announced at the start of the flood not working as reported by several people? Why were the people forced to resort to calling the news channels to arrange to rescue their loved ones barricaded by flood waters in their own homes? What prevented the disaster management department provided call centers from answering the incoming distress calls from which point the whole process of the rescue had to commence? The calamity was in its early stages when the forest minister K Raju who had been given charge of the Kottayam district disaster response has flown to Germany for a conference. The warning signs of an impending disaster that were already visible, did not stop this minister from leaving his state. Also, it was clearly in the early stages of this great flood disaster that Kerala painstakingly endured, when one minister E. P. Jayarajan, who was previously thrown out of the ministry, was being brought back with much fanfare. While the minister who went on tour must explain his act, Government cannot escape the responsibility for letting him go if it had the right focus on a matter of utmost priority and were human lives were at stake. Also, it is a perennial wonder for me and something I see happening across India, that with a population of more than one twenty crore (1200 million), and enough people as members of various political parties, we still must bring back leaders on whom aspersions were cast. It is the biggest mystery that our politicians still think that their usual candidates for ministerial ship has no replacement. While extremely heavy rain has been blamed for the great flood of Kerala, we have seen how politicians have thwarted the efforts of the likes of VS Achuthanandan (former chief minister of Kerala) and the former sub collector Sriram Venkataraman in reigning in the land encroachment in Munnar and Idukki district sometime back and how the corrupt had finally silenced them. We do not have to travel to Munnar to see small and large water flow being diverted or stopped in various areas across Kerala. Small rivulets are blocked in thousands and during monsoon there is a small flood in various localities owing to these blockages. Madhav Gadgil report on protecting Western Ghats have been equally subjected to rejection without honestly looking into its merits by the same politicians and people who have no concern for the fragile environment. Restrictions on mining and quarrying. Use of land for non-forest purposes. Unabated proliferation of high-rise buildings. He is also on record recommending bringing down all dams which are fifty years old. We seem to have some dams that are at least hundred years old. It seems the recourse of the general public is to have faith in the great British engineering and pray God not to break dams. Opening date of the Mullaperiyar dam (built during the British rule by the British) is recorded as 1895 in Wikipedia. We are well over hundred years at least in this one case. Politicians of the time along with the so-called people protectors duly rejected and put the Madhav Gadgil’s report to the dust bin. Professor Kasthuri Rangan was called into issue another report on the same subject as if Madhav Gadgil was not good enough; in fact, that effort to get another report was indeed aimed at watering down the Gadgil report. Professor Kasthuri Rangan report also was duly moved to the dustbin. Ecologically sensitive and extremely important Western Ghats remained unprotected to this day, with unapproved quarry’s present all over the place and under all political parties’ administrations. You must be reminded that the landslides were accorded a large number of deaths in the Great flood of August 2018 of Kerala, the magnitude of which was at least partially attributed to the environmental damage in environmentally sensitive areas. Global warming facing the world is threatening low lying areas across the world including reportedly Kochi, Kerala cannot be mute spectators to environmental damage and encroachment. Every effort must be made in both protecting the environment and improving it so that the effects of the natural calamities such as this great flood is at least reduced. Please also note that we are living at a time of unusual politicians such as the US president Donald Trump who is doing everything in his capacity to thwart the efforts of the global community in preventing global warming such as reaching the Paris accord. The “Apex Body for Disaster Management” in India is the National Disaster Management Authority. It may be the best approach for one agency to take over the command and control of disaster response instead of any possible chaos from other type of leaderships. Such a takeover for all command and control once a disaster is declared by the state government, may help develop better coordination at the top of the disaster response system hierarchy. 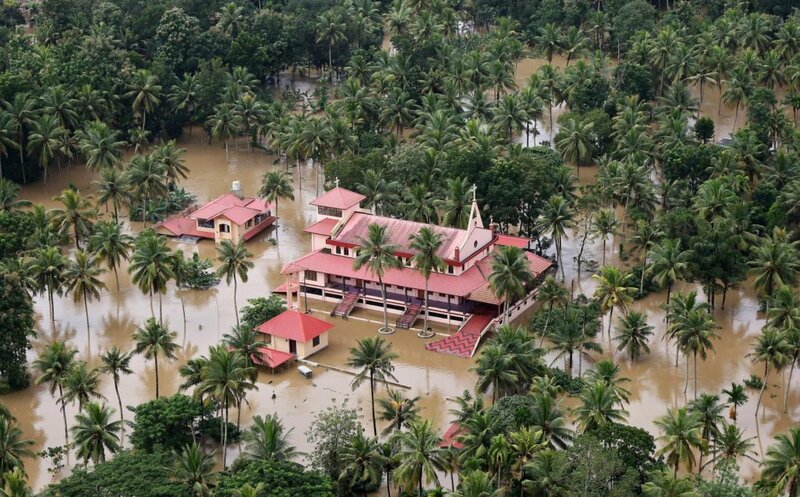 The biggest lesson from the great flood that faced Kerala has been how unplanned we are for a disaster of this sort. While it may be hard to avoid some pitfalls, overall response starting from answering the calls on an announced number and recording the names and locations of the affected as the calls come in, is a bare minimum. NDRF which was formed some years back may be the right team to vest the complete responsibility of a response. However, they do not seem to be an all-encompassing entity that is given full responsibility and the control of the response once a disaster is struck. Lapses are clear while work done in isolation by various teams deserve appreciation. The right coordination and a body that oversees overall response have been clearly missing. Chief Minister Pinarayi Vijayan, rightly remarked them as “Kerala’s military force” while commenting on their remarkable effort on the frontlines of the flood rescue operation. If there was one sparkling example of special greatness during this flood disaster response, despite everyone else’s outstanding work, it was our dear fishermen’s spirited endeavor. They are one group of people who are receiving all around appreciation. They worked tirelessly and selflessly for day and night for the rescue operation. This shows that whom we really rely on during a great flood disaster, will be our local fishermen. It is also especially important to note that when thousands of houseboats owned by obviously more affluent of Kerala, did not bother to provide serious help in this flood disaster response. Enormity of the calamity should touch every person who cares and swing into action to support. However, for some, it seems the suffering of their fellow human beings do not matter. Minister Sudhakaran is known to order police to arrest the owners of the house boats who refused to support the rescue effort. It must be noted that while the rescue effort was ongoing, the opposition leader Ramesh Chennithala, repeatedly appealed for handing over the rescue as a whole to the Indian military. His request gathers weight due to the fact that on the ground, hundreds of people were left unreached even after four days of being isolated without food or water. This body has a website and facebook page as linked below. However, there is no manual on how they shall respond to a disaster. It is important that common public has a confidence in their response department. It is important to document clearly how the hierarchy of the official response team will be structured and who will lead the coordination of governments various arms and forces. However, currently, they do not even state what their stated goals are, on the website. They must create a manual that is available to the general public. The government or whoever is in charge of the response must follow this manual in case of a disaster. How do they activate various response functions and how common people and those who are struck in the disaster zone make contact must be well documented in this manual. There are hundreds of questions such as this one a disaster management manual would be capable of answering. If every step, process, and procedure is well documented and communicated prior, there must be no doubt in anybody about their role in the event of a disaster and what actions they are expected to take. The preparedness is what matters most in handling a disaster of this magnitude. Planning is needed along with the drills, leadership, and clear role assignments. Experts must be posted in the department who can take adequate control and invoke emergency protocols that must govern the response. Chaos is often the order of things in our response as witnessed repeatedly during former disasters and during this great flood. The importance of the disaster risk reduction cannot be emphasized enough; however, once a disaster is struck, everything depends upon how prepared we are for a coordinated response. There must be also enough planning on the recovery areas. There must be designated centers for camps, officials posted in camps along with adequate food, and medical aid. More than four hundred lives have been lost. Innumerable suffering has been caused to thousands of people. How well the whole disaster was managed prior and post it struck, merits serious postmortem under the circumstances. Extremely heavy rains were forecast by the weather department. Meteorological department attributed the heavy rains to a low-pressure system. It is clearly the root cause of this great flood that devastated state of Kerala. Everyone agrees that we can’t control the rains. However, did we give sufficient weight to the other forewarnings and prepare well in areas of dam management, alerting the general public well in advance, preparing for rescue operations, and preparing for proper shelter facilities? As a forewarning, there was already a minor flood and ongoing refugee camps in Kuttanad area weeks before the great flood. The KSEB (Kerala State Electricity Board) officials are on record stating the possible loss of revenue when dam shutters are open and if it was later deemed unnecessary. They needed to realize sufficiently that human lives were at stake even if there was going to be a loss of revenue by opening the dams sometime earlier to control the water flow into the low-lying areas. Reports about dam management planning and alert level changes were coming out continuously as we were staring at an impending great flood. Lives have been lost and people have been put to great suffering following the flood. Hence question and the seriousness of how carefully whole management of the affair has been conducted prior and post the flood fury is a very serious question. Those responsible for any lax must be held accountable so that at least future preparedness will be given enough importance and care. What happened to the promised trial run in case of Idukki dam? A local MLA in Idukki was seen asking why it was not done as promised to the local public? Was there a prior assessment of what would happen if a large number of dams were open at the same time? Even as the decision to open the dam flood gates was being delayed, why were the people in the nearby areas not moved to safety in anticipation? Did the district collectors receive enough time so that they can sufficiently warn the residents of the river banks and also prepare the shelters for their evacuation with food, medicine, and other necessary essentials stored at those camps? The amount of rain in the dam’s catchment area. Conditions on the river basin and banks. Speed at which the dam is filling up. Allowed maximum water levels of the respective dams. Have all these parameters been sufficiently considered and serious and timely discussion undertaken with all departments prior to opening the dams? Was it impossible to stagger the opening of each dams’ shutters and well as individual dams number of shutters so that the deluge would have been manageable and probably not cause flooding of the scale of a great flood? Why the KSEB was even mentioning the financials at a time when the state was reeling in heavy rains and facing impending flood and putting human lives at risk? How precise was the timing of the openings and parameters used for the assessment for such an opening? While the MET forecast on extremely heavy rains was in front of us, why was it not possible to open a few shutters much earlier, so that the water levels could have been brought down anticipating the inundation in the dam’s catchment areas? Since the flood happened so fast and mostly in the night, authorities did not have sufficient time to extend ample warning through direct mike announcements and awareness to warn the general public close to the river banks. However, the questions as raised above needs answers to find out whether there was a possibility to gain a better control on the disaster that ensued. Dam break analysis was being called by experts who conducted previous studies about the disaster management in Kerala. While we are dealing with flood like fighting the sudden fire, what level of preparedness do we have in the event of a bigger disaster? I read every day. But if you ask me what they mean, I have no clue unless I go for some reference to find out. How do you expect general public to know clearly what the risks are unless they are clearly and individually told by the authorities by visiting their localities? The message should have been direct and given well in advance stating in such terms as “those who are 500 meters from the river bank must immediately evacuate”, so they understand the dangers clearly. District Collectors are trained on how to alert people, evacuate them and provide all necessary support. But unless they have sufficient forewarnings, they are incapable of an effective evacuation operation especially in a situation where infrastructure is already damaged in incessant rains. Several people have complained on news media that they received no warnings whatsoever from the authorities. How can we ignore such lapses when human lives were at stake? A ruling party MLA was retorting on live TV debate that people watch TV all the time in Kerala and they knew what was happening. Was he referring to the governments warning systems works through the news channels, especially when the water rose in the middle of the night and with no electricity in several locations? It may be true that the magnitude of the flood was so great that no amount of response would have been adequate. It is also a fact that thousands of people, various forces, officials, and the political leadership did their best to try and save the lives of the dear ones. However, it is also true that the high level structure of the disaster management mechanism needs a lot of improvement and there are clear gaps in the current response. The structure and who heads and coordinates the effort with various teams from NDRF, the military, state fire and police force, and district authorities on the ground, needs clear definition. A single proposal I must put forward is to provide the Kerala Disaster Management Authority (SDMA) all essential resources in office space and man power on an urgent basis. As already suggested earlier, being specially trained and the experts in dealing with a disaster, either NDRF or SDMA must retain overall control and management in the disaster affected areas. Once a disaster is declared in an area, administrations higher authorities and even the political leadership must be placed below the NDRF or SDMA. Other expert groups including the military and even the local fishermen (in case of a flood disaster) may be positioned below in the hierarchy to make use of their services as they deem necessary. They must be also working with a goal of risk reduction at the highest levels and with enough authority, always. They also must maintain the highest level of preparedness for dealing with any future disaster. Better coordination and a disaster management leadership structure at the highest level are clearly needed to deal with any future disasters effectively. It is evident that previous disasters of Cyclone Ockhi and Tsunami have taught us nothing. Chaos at the highest levels of the government disaster response leadership should not be the norm at least when the next disaster strikes, that’s all we can hope at this time. Prevention is better than cure; but prevention comes from political will and leaders who have love, care, capability, honesty, and pursue a policy in accordance with the best for their land and people. Are we destined to have such a leadership? It remains to be seen whether we are fortunate to see political will and future proof policy making in Kerala’s disaster risk reduction and disaster management preparedness.